While the Sandy Ridge Trail System may be one of the best mountain bike draws in the United States, it's not the only "must-ride" destination for mountain bikers in the Sandy area. 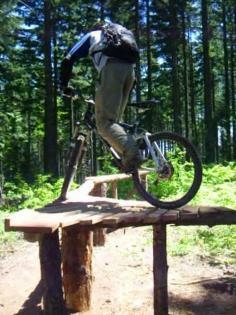 We are blessed with some incredibly picturesque mountain bike trails, from the fairly kid-friendly trails at Sandy River Park and Tickle Creek Park in Sandy, to the beginner/intermediate cross country mountain bike trail systeme around Government camp and Timberline Lodge, to the heart-pumping lift-assisted downhill runs at Mount Hood Adventure Park. 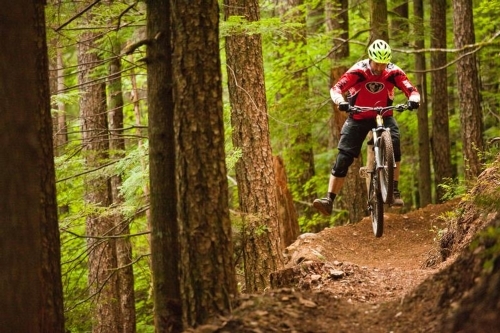 See what the region has to offer the mountain biking enthusiast below. The rating system shown on this page is the same rating system used on the ski slopes - a green circle indicates an easier trail, a blue box indicates intermediate skill level is required. Black diamond trails are difficult, and the double black diamond trails are meant for experts only. One of the best resources available on the internet for mountain biking trails is the MTB Project's site ( www.mtbproject.com ); this site can be accesed on your phone or computer, and provides maps, trail data, current conditions, and pictures/video of each of these trails -- many of the links provided below to these trails are links to the MTB Project's data. Also, don't forget to check out the "Resources for Mountain Bikers" section at the bottom of the page for links to service retailers, rental shops, maps and more! Happy riding! Originally constructed in 2009, the Sandy Ridge Trail System is one of the crown jewels of mountain biking in the Pacific NW. More than 125,000 mountain bikers visit the Sandy Ridge Trail System every year now, and the complex has become so popular that the U.S. Bureau of Land Management will soon add almost 200 acres of land, 2 miles of new trails and double the size of the parking lot to keep up with capacity The Sandy Ridge complex currently contains 10 separate trails totaling over 15 miles of single-track goodness at varying skill levels for your riding pleasure. Partial or full-suspension mountain bikes are recommended -- if you don't have a bike with suspension, see below. How to get there by car: From downtown Sandy, head east out of town on US26 for 11.4 miles. Turn left on E. Sleepy Hollow Drive (note: This is the second turn-off for E. Sleepy Hollow Drive!) soon after passing Windell's Camp on the right hand side of the highway - look for the brown sign that says "Sandy Ridge Trailhead" with an arrow on the right hand side of the highway. Go 0.3 miles, take your second right onto E. Barlow Trail Road and go over the Sandy River. After about 1 mile, look for the trailhead signage on your left hand side. How to get there by bus: Board the MHX with your bike at the Sandy Transit Center at Centennial Plaza and get off the bus at the Hoodland Senior Center stop in Welches. Walk your bike across US26 and head west, turning right after a few hundred feet onto Brightwood Loop Road at the arrow sign for Brightwood. Ride 1.6 miles and take a hard right onto Brightwood Loop Road at the arrow sign for Brightwood. Follow Barlow Trail Road for almost 1 mile until you see the trailhead signage on your right hand side. Hours and fees: The Sandy Ridge Trail System is open year round from dawn 'til dusk and is completely free -- although there is a donation box on site that helps to cover the cost of trail maintenance incurred by the NW Trail Alliance (www. nw-trail.org) Donations gladly accepted. Don't have a mountain bike with suspension? : To get the full experience at Sandy Ridge, it's best to ride a bike with either partial or full suspension. Fortunately, you can now rent one for the day in Sandy. Through a public/private partnership with the City of Sandy, you can rent a variety of mountain bikes for daily rates at Otto's Ski & Mountain Bike (38716 Pioneer Blvd - days and hours vary depending on the season). Choose from hard tail and full suspension bikes by Trek in a variety of sizes and models. For rental reservations, call Otto's at (503) 668-5947. US Bureau of Land Management - Owner of the complex - get additional info about the trail system including a detailed map. Northwest Trail Alliance - Helped build and maintains the trails at Sandy Ridge - a chapter of the International Mountain Biking Assocation (IMBA). Media articles - Check out this 2010 Wall Street Journal article , this 2013 Oregonian article , and this 2016 Oregonian article showcasing Sandy Ridge and it's growing popularity. The Mount Hood National Forest (MHNF) contains over 1 million acres of some of the country's most beautiful terrain. The Government Camp Trail System is a collection of MHNF single-track mountain biking trails in the Zigzag Ranger District near the resort town of Government Camp on the south flank of Mount Hood. This system provides about 26 miles of trails, mostly in the easy to intermediate skill range, and includes access to Timberline Lodge, Trillium Lake, the old Barlow Trail and the Village of Rhododendron. One of the most popular rides is a shuttle assisted ride from Rhododendron to Timberline Lodge -- catch the MHX in Rhododendron to Timberline Lodge, then ride mostly downhill to Rhododendron using the Timberline to Town, Crosstown and Pioneer Bridle Trails ( www.mtbproject.com/trail/7006432/timberline-to-rhododendron ). Goverment Camp Trail System trail data - Please click on the following links for trail maps, descriptions, rating info and detailed trail data from the MTB Project. Click on the links in the table below for individual trail information. Most of these trails are multi-use, so please yield to hikers. With about 140 miles of trails open to mountain bikes, the MHNF is a great place for riders of all skill levels from novices to experts. The cycling-friendly trails listed below are multi-use trails, so the Forest Service asks that you please follow trail etiquette and yield to hikers and horses. Please make sure you have a valid Northwest Forest Pass prior to parking your car at trailheads to avoid fines. Below are links to all of the mountain bike friendly trails in the Zigzag (Sandy to Government Camp) and Clackamas River (Estacada) Ranger Districts not listed above. All links include a brief trail description, directions to the trailhead and trail data. You can also visit the USFS mountain biking page or contact the USFS Zigzag Ranger Station for the MHNF for more information. The Mount Hood Adventure Park is the summer activity center for the Mount Hood Skibowl resort. The Adventure Park contains a smorgasbord of activities for the mountain biker including the Freeride Bike Park , the Mountain Bike Skills Park and an entire network of lift-asisted mountain bike trails around the resort serviced by the Scenic Sky Chair to take you and your bike either mid-mountain or all the way to the summit. In addition to mountain biking attractions, the Adventure Park has a number of unique rides and attractions available for your outdoor recreation pleasure, including the Alpine Slide , the Summer Tube Hill , bungee jumping , an 18-hole disc golf course , batting cages , Kiddie Kart and Malibu Raceway cart racing, zip lines and much, much more. Take the family and make a day of it! How to get there by car: From downtown Sandy, head east out of town on US26 for approximately 27 miles. Look for the signs for "Mount Hood Skibowl" as you approach Government Camp. How to get there by bus: Board the MHX with your bike at the Sandy Transit Center at Centennial Plaza; get off at the Ski Bowl West stop. Hours and fees: See "Operating schedule" and "Tickets and pricing" in the "Links" section below. Mt. Hood Adventure Park - primary link to their summer site with information about all of the attractions & offerings available during the summer season. Map of Mt. Hood Adventure Park - See all of what the park has to offer on one page. Mountain Bike Tours - Guided tours are available for all levels of ability. Reservations are required 72 hours in advance to ensure availability. Discounts are available for groups of 2-5 and 6 or more. $10 off if you have your own bike! Operating schedule - Hours of operation and information about when the summer season begins and ends. Tickets & pricing - Information about different passes and associated rates, from hourly to seasonal. Tickle Creek Trail - This 1.8 mile packed gravel trail is an ideal off-road path for a leisurely family ride. Riders can use wide-tired commuter type bikes and kids bikes as wll as mountain bikes. The trail was completed by the City of Sandy in late summer 2011 to serve as a crosstown multi-use transportation corridor for cyclists and pedestrians. It is designed as an easy ride intended for all skill levels. This trail also has a lot of foot traffic, so please yield to pedestrians. Jim Slagle Loop Trail @ Sandy River Park - This 1 mile dirt loop trail in Sandy River Park begins at the trailhead on Marcy Street (0.3 miles north of US26 & Bluff Road) and ends at the south bank of the Sandy River. Great for a leisurely summer picnic on the banks of the river, or for watching salmon swim up Cedar Creek to spawn. Most of the trail can be done by all skill levels. You may need to walk the last short section where it drops down to the river. This trail is also a popular walking path, so please yield to pedestrians. The Mount Hood National Forest is currently studying a proposed lift-serviced downhill mountain bike trail system at the Timberline Ski Area. The proposed project would add 17 miles of newly constructed single track trails to the resort, as well as a mountain bike skills park and rental facility. Development of the Timberline Bike Park Project is currently on hold due to ongoing legal action -- projected completion date for the project is currently unknown. For current information, click on the link below. MTB Project: Oregon - An excellent directory of all the best mountain bike rides and trails in Oregon. This smart-phone friendly website recently sponsored by REI includes user ratings, trail data, detailed trail descriptions and maps, current trail and weather conditions and much more! Ride Oregon Ride: Find a Ride - A trail and ride finder from the State of Oregon's official tourism office. Be sure to select "Mountain Biking Trails" under "Ride Type" and de-select everything else for mountain bike trails. Otto's Ski Shop (Sandy / 503-668-5947) - Single day or multi-day rentals available. All rentals are Trek bikes with partial or full suspension. Mt. Hood Adventure (Govt Camp / 503-715-2175) - For use at Mount Hood Adventure Park or nearby trails. Hourly, half-day and full day rentals available. Mt. Hood Adventure Base Camp (Rhododendron / 844-200-7368) - Hourly, half-day and daily rentals available. All rentals are Giant or Diamondback bikes, hard tail or full suspension depending on model. Helmet and gear rental and clothing sales. Mountain Sports (Welches / 503-622-3120) - Bike sales, rentals, helmet and parts sales. Hurricane Bike Rentals @ Skibowl (Govt Camp - 503-272-0240) - Hourly, half-day and full day rentals. Front or full suspension. Otto's Ski Shop (Sandy / 503-668-5947) - Certified bike technician on staff during mountain biking season. Call first - hours and days vary. Sandy Bicycle (Sandy / 503-826-1070) - Bike technician available daily. Open M-F from10-6, Sat. from 10-5. Mountain Sports (Welches / 503-622-3120) - Can perform basic repairs. Open Thursday through Monday. Mt. Hood Bicycle (Govt Camp / 503-622-0672) - Mobile bike repair service. Also available for pickup and delivery, ride support, and bicycle receiving and storage. 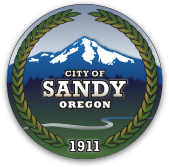 City of Sandy Bike Map - Detailed maps of cycling assets the Sandy area. Brought to you by the City of Sandy. 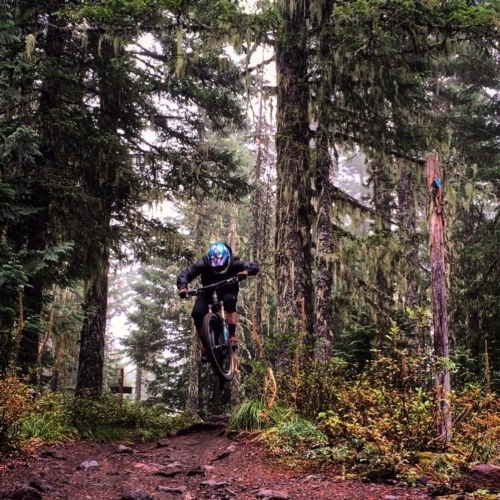 Mountain Bike Trails In The Mount Hood Area - Detailed maps of Sandy Ridge, Ski Bowl and Mt. Hood National Forest trails near Government Camp created by the Mount Hood Chamber of Commerce and Clackamas County Tourism & Cultural Affairs.